Jordaan buoyed as Johannesburg hosts "watershed seminar"
The President of South Africa's Football Association (Safa), Danny Jordaan, has promised to push Fifa for a bigger allocation of World Cup places for Africa. Jordaan, speaking to the BBC after a three-day Fifa seminar in Johannesburg, also welcomed discussions on other "critical issues" such as "reforms within football." 28 Confederation of African Football (Caf) Association Presidents, Secretary Generals and Technical Directors came together in South Africa, in what Caf vice-President Suketu Patel described as a "watershed seminar." "The seminar was all about establishing new benchmarks for the administration and organisation of football on the continent. Is there a case for an argument of increasing the number of slots for the African continent?" "From a football perspective it was about agreeing on the importance of having qualified technical directors and a technical direction for African football. "From an administrative point of view, we talked about governance and compliance - and what are the benchmarks and the various compliance issues; whether it's financial compliance or regulatory compliance." African football has often been dogged by controversy within individual associations and Jordaan is hopeful that some of the strategies implemented by Fifa worldwide, such as spot-checks on various associations, may help develop football within Africa. "I think very often the problems in administration and financial problems created or stunted African football's growth and progress. Now Fifa has also established the independent audit and compliance unit, where they will select - on a sample basis - national associations on the continent. "That will help us to really keep the focus on the essence of football associations' core business - and that is to provide a quality service, quality teams and competitive teams." Jordaan also reiterated his desire to address the thorny issue of how many African places should be made available at future world cups. Africa's allocation is currently five, with Nigeria, Ivory Coast, Ghana, Algeria and Cameroon set to compete in Brazil. Jordaan says the reasoning behind this allocation needs revisiting. "The allocation of slots in the World Cup is based on a decision taken in 1994 in the congress in Chicago, just ahead of the World Cup in the United States. "When that allocation was made 20 years ago, was African football still at the same place, and if not, what progress has been made, and is there a case for an argument of increasing the number of slots for the African continent?" Jordaan is keen to bring these issues to the table at the Fifa Congress after the World Cup. After the three-day conference in Johannesburg, the Safa President also paid tribute to Fifa for its unwavering support of African football. 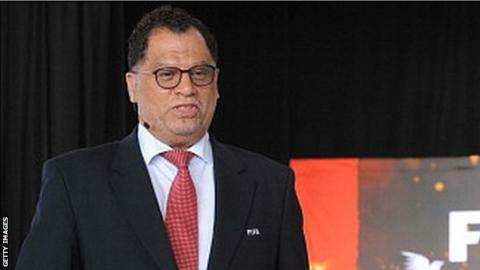 Jordaan said "it was an honour for Safa to host such a seminar."